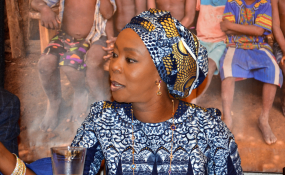 New York — Toyin Saraki has addressed the United Nations General Assembly and outlined the key interventions which must be made to transform health outcomes for women, children and communities around the world. Mrs Saraki was requested to make her address at the launch of the Independent Accountability Panel report ‘Private Sector: Who is Accountable,’ as mandated by the UN Secretary-General. Throughout the United Nations General Assembly this week, Mrs Saraki – as Founder-President of the Wellbeing Foundation Africa – laid out her vision at the panel discussion of the report which calls on governments, parliaments, private sector partners and multilateral agencies to establish effective accountability systems. Following her United Nations address, Mrs Saraki joined the Director-General of the World Health Organization, Dr. Tedros, and the President of Uruguay, His Excellency Tabaré Vázquez, at a global press briefing to mark the WHO Non-Communicable Diseases Declaration. Mrs Saraki, who also serves as Chair of Nigeria’s Primary Health Care Revitalisation Support Group, subsequently participated in the United Nations General Assembly Third High-level Meeting on the prevention and control of noncommunicable diseases (NCDs), which undertook a comprehensive review of the global and national progress achieved in putting measures in place that protect people from dying too young from heart and lung diseases, cancers and diabetes. The high-level meeting at the Trusteeship Council of the United Nations Headquarters was opened with a keynote speech delivered by renowned philanthropist Michael Bloomberg, former Mayor of New York City.